Thank goodness I did not have much planned for today. After the long drive this weekend and the emotions that kept surfacing, it was good to take it easy. For me that meant going on my morning walk, eating breakfast, and then taking my daughter’s suggestion to take a nap. At first I thought, really? A nap? Then I thought, why not? Outside the day was cool and grey and a nap was the perfect remedy for my blues. After an hour or so, I awoke refreshed and better prepared to tackle some tasks. One of those tasks includes my daily practice of writing “morning pages” that I began in January. I’ve mentioned it here before, but it bears repeating. Each day I commit to writing 750 words, which equates to about three pages. This is a practice found in the book, The Artist’s Way, and I have done it before. However, this time I am doing it online via this website. Each day I get a reminder email sent to my inbox and after I have completed my words, or pages, a quick analysis of my writing is given. Writing each day is a wonderful habit and I encourage you to check it out! 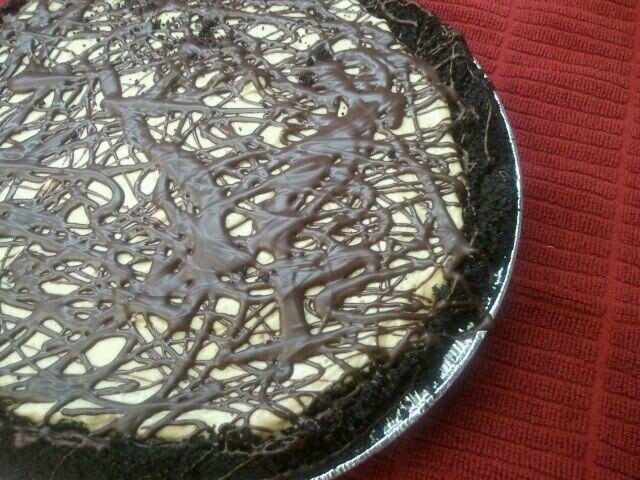 After my “work” was done, I prepared a lovely treat – a Chocolate Peanut Butter pie for a couple of neighbors that live up the street. Perhaps I had been thinking about them because my “baby” has moved away and one of the memories I have of them occurred after their last baby was born. I was so delighted for them and oohed and aahed over their little one. After that meeting, I occasionally saw Robert or Vonna walking the baby in a snuggly. It brought back fond memories of me doing the same with my children. Fast forward to a year or two ago when I was visiting my friend Mia’s kindergarten class at Helman Elementary. There I saw Vonna at one of the small tables helping a child and was stunned to find out that the child was her “baby” and he was 5 years old! Which means that today that little boy is seven and in the second grade! I am constantly amazed at how fast time goes by and how short a time a child actually spends as a baby. This afternoon I brought Vonna and Robert my pie creation. Vonna seemed concerned that there were Lego‘s on the floor of the living room. I think it is wonderful that her child’s playing and creativity is given a priority. We can always have a clean house, but raising healthy well-adjusted kids, now that’s a far more admirable accomplishment. In fact, I can’t think of a better one! as I’ve learned to my sorrow. This morning as I scanned Facebook posts wishing everyone a Happy New Year, I read a note written by my friend Aimee. She mentioned that she had recently been told about a website called 750 Words. You can read more about it here, but in a nutshell, we are encouraged to begin each day by writing 750 words (roughly three pages). It is based on an idea promoted in the book The Artist’s Way by Julia Cameron. As I understand it, it’s a way to release all the “clutter” in your mind so that you can allow the important thoughts, ideas, etc. to come through. I’d read about this “practice” a few years ago, and from time to time I have begun my day in this way. The first time I tried it, it was hard to imagine what I would find to write about but in a few minutes the words began to pour onto the page and in ten or 15 minutes I was done. Each successive attempt at writing my three pages has been equally successful. So, why don’t I do this more often? I suppose sometimes I get lazy or I forget about it or maybe I feel too busy with other things. But I think that will change with the “750 words” website. One big difference is that you are typing and not writing long hand (which makes reading my work infinitely easier!) and there are little rewards built-in to make it fun. Today it took me about 15 minutes to get to 750 words and I felt better at the end of the exercise. While not really a New Year’s resolution, I hope to make this a daily habit and encourage you to see if it is something that would interest you. As for my pie of the day, a neighbor of mine mentioned that her friend Peggy might like to receive a pie. She thought a quiche might be appreciated and that was pretty much all that I needed to get started. 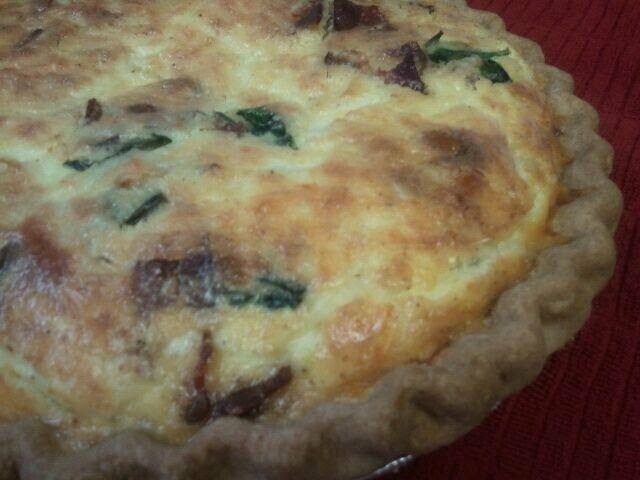 I cooked bacon, spinach and onions and grated some sharp white cheddar for this pie. In no time at all it was in the oven and an hour or so later we were on our way to deliver the quiche. I was met at the door by a man who welcomed me in and went to announce me to Peggy. When she first saw me, she definitely seemed a bit curious. Immediately I mentioned my neighbor’s name so that she would feel more at ease and then I briefly explained my pie project and that today’s pie was for her. When she had heard my tale, Peggy’s beautiful smile was the best reaction I could ask for… and an absolutely wonderful beginning for the new year.